On Monday while wandering aimlessly around the protein section of my neighbourhood MarketPlace IGA I was approached by one of the butchers who asked: "Looking for anything in particular ?" to which I replied: "Not really, just something for dinner tomorrow" to which he then responded: "How about some Flank Steak, I've got about a 600 gram piece I cut on Saturday, I can let you have it for $4.99 a pound." I said "Yes please" and immediately began planning steak fajitas. I also pondered the incongruity of the butcher quoting me the size, 600 grams, in metric, while quoting me the price, $4.99 a pound, in Imperial measure but .........whatever, the end result was a healthy piece of flank steak for less than $7.00. 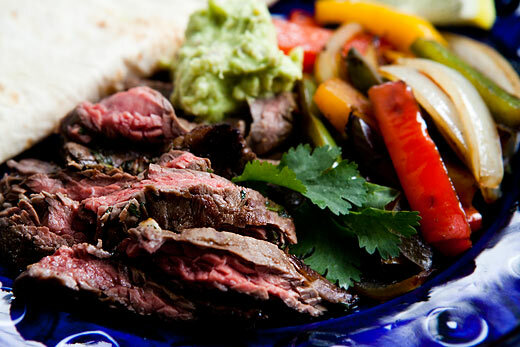 Fajitas are not a Mexican dish, they are pure Tex-Mex, that wonderful fusion of Mexican ingredients with the addition of more meat, and cheese, plus the increase in heat. My steak fajitas ideally use flank steak, due to it's superior flavour, but top sirloin is fine as well. 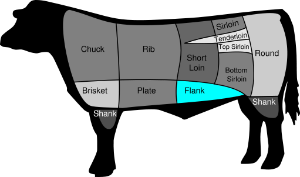 Flank steak is cut from the abdominal area of a cow and as a "working cut" has great flavour, though it is a bit chewey so it is best served thinly sliced against the grain. I took the flank home and gave it a rub with coarse salt, black pepper, garlic, ancho chile powder and minced poblano pepper, I then put the steak in a freezer bag and added 2 tablespoons of olive oil and the juice of one lime and left it in the fridge overnight. After getting home from a lunch shift on Tuesday I made the dough for the fresh flour tortillas, and before the corn tortilla mafia jump in let me remind you that flour tortillas are a Tex-Mex staple, and much better for soaking up the juices of fajitas than corn tortillas, so shut up. My flour tortilla recipe is from the excellent blog Homesick Texan, a must read for those fond of all things Tex-Mex, the flour tortilla post can be found here, I follow it exactly, except I expand it by half so that I get a dozen tortillas rather than eight, because really I'm going to eat one before dinner hits the table and leftover tortillas are like leftover pizza.........great to have around. I took the recipe as far as the "roll them into balls in your hands, place on a plate (make sure they aren’t touching) and then cover balls with damp cloth or plastic wrap" part and then drove daughter to choral rehearsal. Once back home I took the steak out of the fridge sliced up sweet onion and some bell peppers, red, yellow or orange please not green, and then rolled out the tortillas. I pan seared the steak for about three minutes a side then placed it, tented in foil, in a 150 degree oven to rest before frying the tortillas and placing them, wrapped in foil, in the same oven. Finally I fried the onion/pepper mixture while making some guacomole. When the onion/pepper mix was almost just right, carmelized but still firm, I took the steak out and poured the jus in with veg, sliced the steak very thinly against the grain and served up the whole thing with the guacomole, some salsa and grated cheese, for daughter, and cold beer for me, wife had a light bodied red . 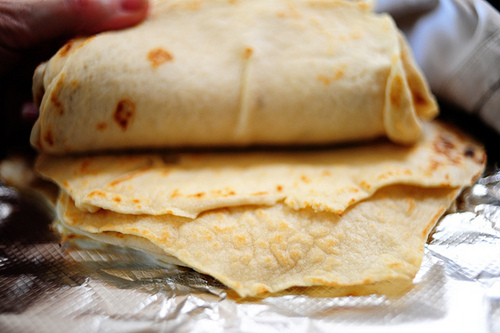 It was magnificent, and the kicker was the freshly made tortillas. I highly recommend making these any time you are having something taco/fajitaish as the difference between these toothsome beauties and anything you are going to buy retail in Vancouver is unbelievable. Of course with 600 grams of beef and a dozen tortillas there were leftover fajitas the next day, and that too is a good thing.